Production of the 2014 Jeep Cherokee was originally slated to begin May 23 at Chrysler's Toledo assembly plant but began a month later. DETROIT -- Chrysler Group is delaying the introduction of the 2014 Jeep Cherokee by a month to make last-minute software changes to the crossover's powertrain. Late Monday, the company took the unusual step of postponing a planned media drive of the all-new Cherokee scheduled for early next month but vowed that "vehicles will still be in showrooms in September." The media event -- in which waves of national and foreign journalists were to gather in Seattle between Aug. 8 and 14 to drive the Cherokee for the first time -- was delayed until at least the first half of September, according to an e-mail from the automaker. "Over the last couple of weeks during final quality and durability testing, we have discovered the opportunity to further improve powertrain calibration" in the Cherokee, the company said. "We will introduce the vehicle to media and consumers as soon as the process is complete," the automaker said in a statement. The company maintained that the new SUV would be "in showrooms in September." The mid-sized Cherokee, a replacement for the Jeep Liberty, is the first Jeep vehicle to be based on a Fiat platform. It will mark the first use of a nine-speed automatic transmission that Chrysler has developed with German supplier ZF Friedrichshafen. When it arrives in showrooms the Cherokee will be powered by a re-engineered 2.4-liter inline four-cylinder engine or a newly developed 3.2-liter V-6 engine. Production of the Cherokee was originally slated to begin May 23. Instead, Jeep brand head Mike Manley said in late June that production of the Cherokee started on June 24 at the automaker's Toledo assembly complex. Manley said that the vehicles would be held and not shipped to dealers until the company was confident that there were no problems. He said the new Cherokee would be available to consumers in August or September, depending on any launch issues. During a media tour of the plant this month, plant officials said they expected to produce more than 400 salable Cherokees per day by early August and have a full second production shift working by the end of August. Chrysler CEO Sergio Marchionne visited the Toledo assembly plant last Thursday to speak with workers and inspect Cherokee production. The visit was not open to the media and was not disclosed until after it was completed. 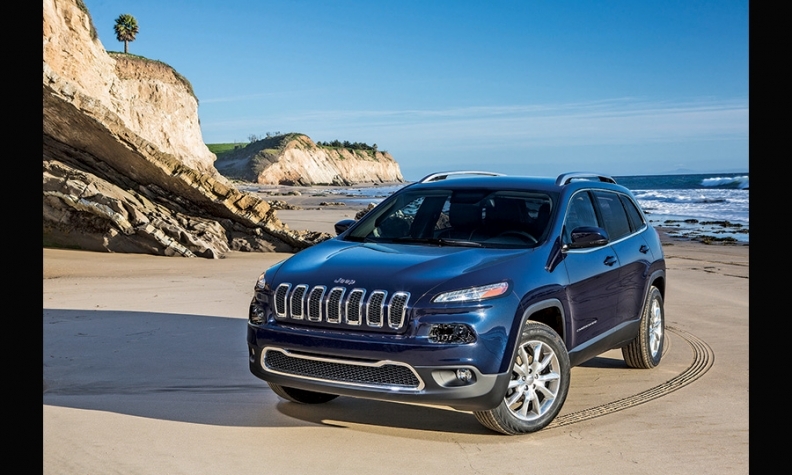 Chrysler is keeping several thousand 2014 Jeep Cherokees from dealers as it "tweaks" the software of the mid-sized SUV's powertrain, Marchionne said today on a conference call to discuss the automaker's second-quarter earnings. The CEO said the vehicle, which is key to Chrysler reaching its sales and profit goals for the year, would arrive in dealerships in September and begin selling "in sufficient quantities" in October. Marchionne downplayed the delay and said the company will work over the next several weeks to ensure that the software changes are made. "These things go on all the time in any product launches and they go on with a certain degree of frequency," he said. "We keep on tweaking and finalizing the car." The second shift of workers at the Toledo assembly plant is undergoing training and will begin production Aug. 19, Marchionne said. "The second half is not doable without a proper launch of the Cherokee. We've been without a car in that segment for about a year, and we're paying a huge price for not having the Liberty," Marchionne said today.